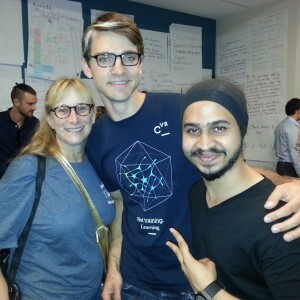 L to R: Avery, Aldis, and Harpeet at the NYVR Meetup on August 19th. Aldis Sipolins, hailing from Toronto, Canada, was another notable attendee at last week’s New York Virtual Reality (NYVR) Meetup. Sipolins was there to demonstrate his immersive learning VR platform, Cerevrum, which he started based on his belief that neuroscience will eventually prove VR is a superior learning method. He calls it “neurogaming”, a combination of virtual reality, machine learning, and cognitive neuroscience. Aldis believes that those currently trying to improve their intelligence with brain training will eventually find what they are looking for in Virtual Reality assisted learning. Aldis ran a virtual reality laboratory for one year at the University of Illinois while earning his PhD in Visual Cognition and Human Performance. During the Spring ’15 semester, the U of I had a new computer science class – Virtual Reality – which was taught by Professor Steven M. Lavalle. Professor Lavalle had previously been on leave, working as the Chief Scientist at Oculus (developer of the Oculus Rift) which Facebook acquired for $2 billion in 2014. Aldis’ experiences at his university eventually led him to start Cerevrum in April 2015. 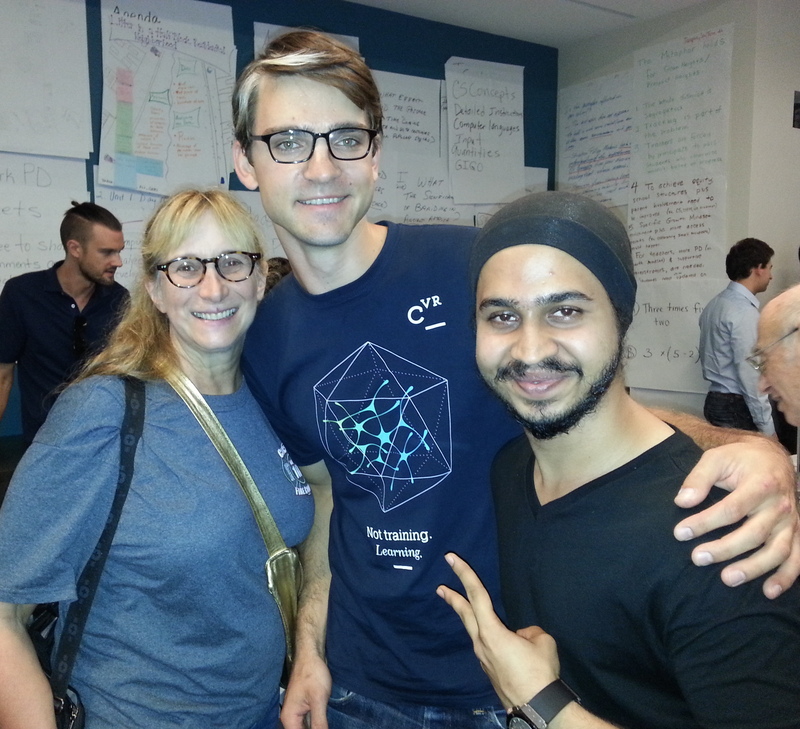 At the Meetup, Seidenberg students Harpreet Wasan Singh and Avery Leider, who have been on the prowl for information concerning the latest advances in VR technology, were also able to interview Aldis and his brother, Nik, who joined him that night to help with the demonstration. Harpreet: Since the time you started with VR until now, what are the most significant developments you have encountered? Aldis: VR has changed enormously in the time I’ve been in the industry. We’ve gone from the screen-door effect in the [Oculus Rift Development Kit] DK1 to not being able to see pixels in HTC Vive. We’ve come from having to use a mouse and keyboard to having incredible motion controls and hand-tracking. Nik: The first and most significant transition is the ability to run [these technologies] on your phone. That’s going to be the democratizing thing in VR – not having to purchase a device that is purposefully built as a Virtual Reality machine. And whether or not [you use VR] with the Samsung Gear VR or with Google Cardboard, or with any other – I’m sure people will figure out many novel ways to attach their phones to their faces – that’s going to be the near future of VR. 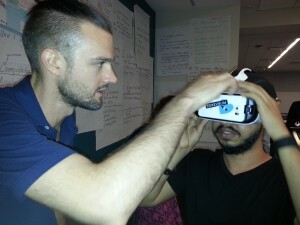 Harpreet: Can you explain what you are trying to do with Cerevrum and Virtual Reality? Aldis: Cerevrum is exciting to me because Virtual Reality opens up so much potential for brain learning. Brain training right now is an unexplored field of Virtual Reality. We’re going to be the first in VR with a brain training app. Brain Training VR opens up a bunch of possibilities of what you can do at a neuropsychological level. Cerevrum adds the missing piece of the puzzle, which is VR. Right now, brain training doesn’t work and it is easy to see why. Pressing buttons on a tiny screen only goes so far. The feeling of presence that you get in VR means that you use the same set of cognitive skills that you do in everyday life. That’s the point of brain training, to get better at the skills you use in everyday life. We live in immersive 3D environments, so I think that it makes sense to learn in them too. Harpreet: What else about VR is exciting to you? Nik: 360 degree photographs. If you’ve never experienced it, get a Samsung Gear VR or Oculus Rift and look at a 360 degree photograph. It’s stunning! People make the same face, they all do the same things, they look around themselves, and are dumbstruck. What I also saw that was cool was a 360 degree video of an acoustic performance. It was a band in a small space and they brought in a virtual reality camera and with your Samsung Gear VR or Oculus Rift headset on, you really felt like part of the performance in this intimate space. What these guys were doing was putting concerts in virtual reality. If you don’t like being in a crowded bar, or you have anxiety issues or can’t afford tickets to the New York symphony orchestra, with this technology you can be in your living room and feel like you are at the New York Philharmonic. Harpreet: There are students at Pace University who want to get into Virtual Reality. What do you recommend to them? Nik: Learn Unity. That seems to be the first skill. Come up with a cool little app that you can develop for VR. Currently the user base is small, as it’s an early technology. Aldis: Pick up Unity. It is free and it is super easy to learn. I was a grad student struggling with programming and MATLAB, and within a few months [on Unity] I was making 3D experiments. It’s very easy. So, pick up Unity, pick up programming, find a good artist, and do whatever you want. Follow your dreams.